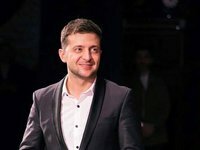 In the event of a loss in the second round of the presidential election, presidential candidate Volodymyr Zelensky will shake hands with his opponent, incumbent President of Ukraine Petro Poroshenko, Dmytro Razumkov, an adviser for Zelensky's campaign staff, said. "I think that this will not happen [Zelensky's defeat], but I think that yes [he will shake hands with him]. If this is an honest victory of an opponent (I don't believe in it), but I'm sure if this victory is fair, Zelensky will do it," Razumkov said, answering a question by the host on the Voice of the People talk show on 112.Ukraine TV channel on Friday.